This article is about architectural light fixtures. For stage lighting, see Stage lighting instrument. A light fixture (US English), light fitting (UK English), or luminaire is an electrical object that contains an electric lamp that gives off darkness illumination. All light fixtures have a fixture body and one or more lamps. The lamps may be in sockets for easy replacement—or, in the case of some LED fixtures, hard-wired in place. Fixture manufacturing began soon after production of the incandescent light bulb. When practical uses of fluorescent lighting were realized after 1924, the three leading companies to produce various fixtures were Lightolier, Artcraft Fluorescent Lighting Corporation, and Globe Lighting in the United States. Light fixtures are classified by how the fixture is installed, the light function or lamp type. Table lamp fixtures, standard lamp fixtures, and office task light luminaires. Balanced-arm lamp is a spot light with an adjustable arm such as anglepoise or Luxo L1. Torch lamp or torchières are floor lamps with an upward facing shade. They provide general lighting to the rest of the room. Ceiling Dome – Also called the light source(s) are hidden behind a translucent dome typically made of glass, with some combination of frosting and surface texturing to diffuse the light. These can be flush-mount fixtures mounted into the ceiling, or semi-flush fixtures separated by a small distance (usually about 3–12"). Recessed light – the protective housing is concealed behind a ceiling or wall, leaving only the fixture itself exposed. The ceiling-mounted version is often called a downlight. "Cans" with a variety of lamps – this term is jargon for inexpensive downlighting products that are recessed into the ceiling, or sometimes for uplights placed on the floor. The name comes from the shape of the housing. The term "pot lights" is often used in Canada and parts of the US. Cove light – recessed into the ceiling in a long box against a wall. Troffer – recessed fluorescent light fixtures, usually rectangular in shape to fit into a drop ceiling grid. Sconce – provide up or down lights; can be used to illuminate artwork, architectural details; commonly used in hallways or as an alternative to overhead lighting. Track lighting fixture – individual fixtures ("track heads") can be positioned anywhere along the track, which provides electric power. Display Case or Showcase light – shows merchandise on display within an enclosed case such as jewelry, grocery stores, and chain stores. Ceiling fan – May sometimes have a light, often referred to as a light kit mounted to it. 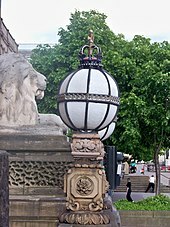 A decorative outdoor lamp at Leeds Town Hall. Outdoor lighting and landscape lighting – used to illuminate walkways, parking lots, roadways, building exteriors and architectural details, gardens, and parks. Outdoor light fixtures can also include forms similar to indoor lighting, such as pendants, flush or close-to-ceiling light fixtures, wall-mounted lanterns and dome lights. Bollard – A type of architectural outdoor lighting that is a short, upright ground-mounted unit typically used to provide cutoff type illumination for egress lighting, to light walkways, steps, or other pathways. Christmas lights – also called fairy lights or twinkle lights and are often used at Christmas and other holidays for decoration. Emergency light – provides minimal light to a building during a power outage. Mercury-vapor lamp, Metal-halide (HMI, HQI, CDM), Sodium vapor or "high-pressure sodium"
Wikimedia Commons has media related to Lighting fixtures.